Around this time last year, I wanted to buy spring and summer clothes to refresh my closet, which was full of old stuff and felt bogged down in stagnant energy. I couldn’t find anything I liked in the catalogs, though, and never got around to shopping in the stores. So I ended up wearing old things and feeling annoyed about it, as I described here. When I realized that was a big part of the problem, I got rid of the worst offenders, but still didn’t have anything new and fresh to wear. Later I noticed that although I’d disposed of some clutter, my closet still lacked space to put new clothes. Maybe that was part of the problem, too? I folded up some old sweatshirts (shown in this post) and put them neatly on an upper shelf, out of the way. My closet looked bare for a while; but when the spring catalogs arrived this year, they were full of lovely things I wanted to buy. 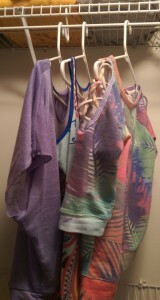 Here’s a photo of three pretty, colorful blouses I ordered recently, with just a glimpse of the old sweatshirts on the upper shelf. My husband mentioned that the colors and patterns looked kind of retro, like something I might have worn in the early ’80s when we met. I hadn’t really thought about it when I ordered them, but he is right about that. Maybe there’s something else going on here subconsciously, like giving myself permission to go back to a simpler time when life felt more spontaneous and fun? OH yes to go back to the simpler times! I like your tops. Good post! Thanks much — glad you like them!